When the No Child Left Behind Act was introduced, it challenged schools and districts to raise graduation rates. In an effort to meet that challenge, schools began offering credit recovery programs — opportunities outside of the standard curriculum for at-risk students to earn course credits and get back on the road to commencement. In some cases, however, these programs focus on quantity over quality. 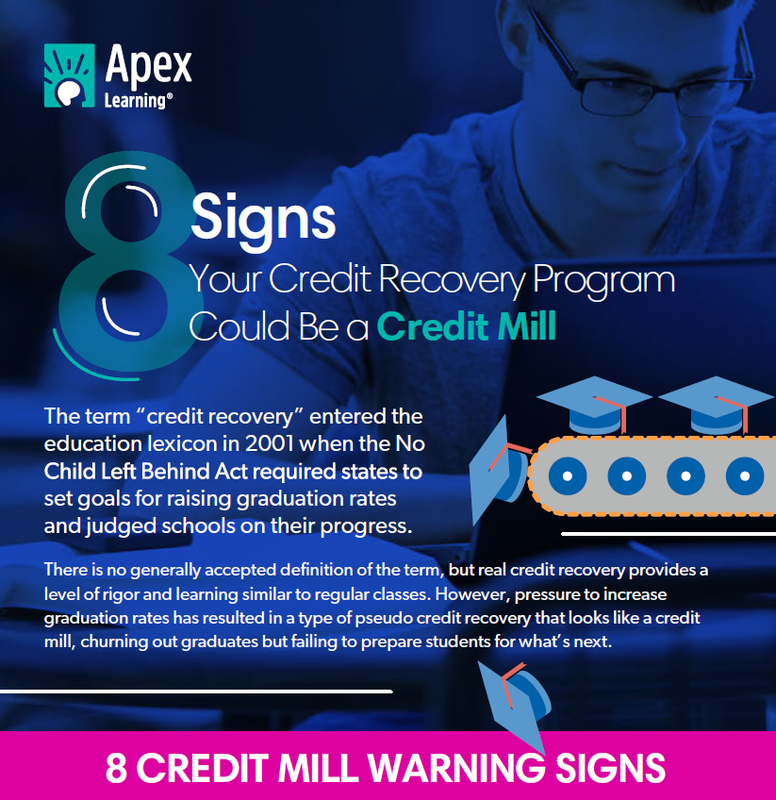 Download our infographic to identify the eight signs that a credit recovery program is actually a credit mill designed just to raise graduation rates without providing the level of rigor or engagement needed to truly prepare students for life after high school. Effective credit recovery programs provide standards-aligned learning and rigor similar to regular classes and actively engage students while providing differentiated support — all qualities of Apex Learning’s digital curriculum. Visit our website to learn how Apex Learning has helped other schools use credit recovery to raise graduation rates and ensure students are prepared for their futures. This infographic is part of our “Really Ready” series in partnership with Getting Smart. For more information, visit the Really Ready Students page.